Every week we pick and pack vegetables. Seeds get planted beginning in December/January and keep going in the ground through the end of August. Actually the seeds should all be in the ground here right at mid-August, any earlier and they kind of burn up, later and there is not quite enough time to grow before cold weather sets in. The last push is happening, and while it is hot enough during the day to make it uncomfortable to get seeds in the ground it must be done. Our vegetable CSA goes until November and them after that there are still many things that grow all winter in the hoop house, after germinating in the fall. 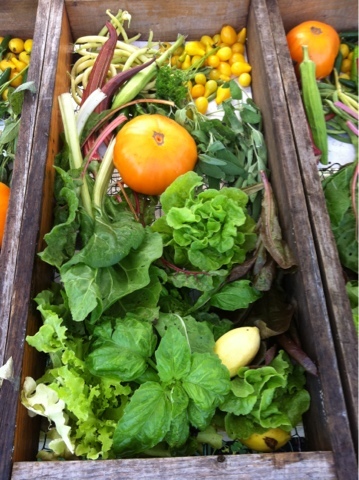 Here is this weeks share: tomatoes, green beans, peppers, rainbow Swiss chard, lettuce, okra, squash, herbs. For weeks there have been many tomatoes and now that season is ending, not done yet but the peak is over.